Just study pics of the design you want to build and shape till comfortable to your hand. Here is a link to a thread that covers some of the question. If you have any handguns at home (revolvers or pistols) just measure the LOP on those. Also, ask yourself it that LOP is a good fit for your hand. If that's so then you have your LOP for your pistol build. That's what I did when I built my pistol and it worked out great!! What I do is start with a paper drawing, using my barrel, lock, and trigger, just like drawing a plan for a long rifle. You’re right, you need to determine where your parts go first. 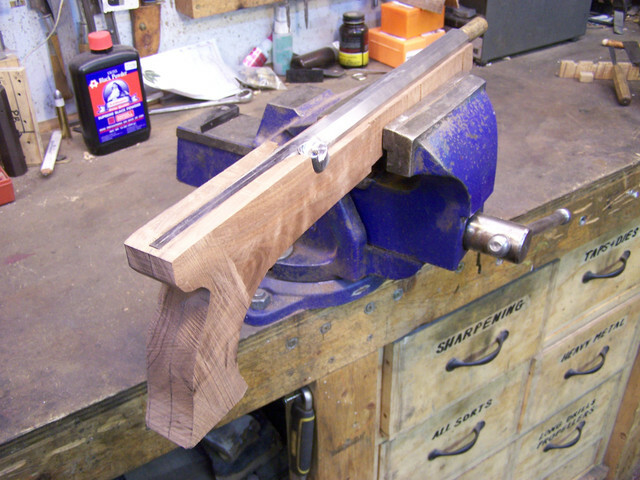 Then transfer the drawing to a piece of pine 1x6, bandsaw it out, and drive a finish nail where the trigger is located. Then, play with the “try stock” until it fits your hand, rasping off, or glueing on, until you’re satisfied...then you have a stock pattern. Just how I tackle pistols, YMMV. I agree with g.pennell worked for me. Once you have your numbers from that first one the next one comes allot easier. I have been thinking on this subject since it was first posted. A lot of what you are asking depends on the type of shooting you plan to do with the pistol. If you are going to shoot it in bulls eye competition or if you are going to shoot it with two hands. Do you like a high grip or a low grip? At any rate if you are going to use a set trigger, get it and design your pistol around it. If you are going to use a single trigger you have more latitude since you can alter pin location and the total configuration of the trigger, if your first attempt doesn't work out. If you haven't done much pistol shooting with Kentucky style pistols ask someone that has one to let you shoot theirs. A lot of pistol designing has to do with pistol shooting. I try to shoot my pistol at least once a week. One handed, as most paper competition is one handed. I'm currently building a target pistol for a friend. He wants a saw-handled piece in percussion. He bought an L & R percussion lock, a 15/16" .50 cal. barrel, a trigger guard, a 1" Hawken style hooked breech plug and tang, and I provided a single set trigger I bought years ago from MBS. He also came up with the walnut for the stock. First draw the barrel and the breech system on a big sheet of card stock. 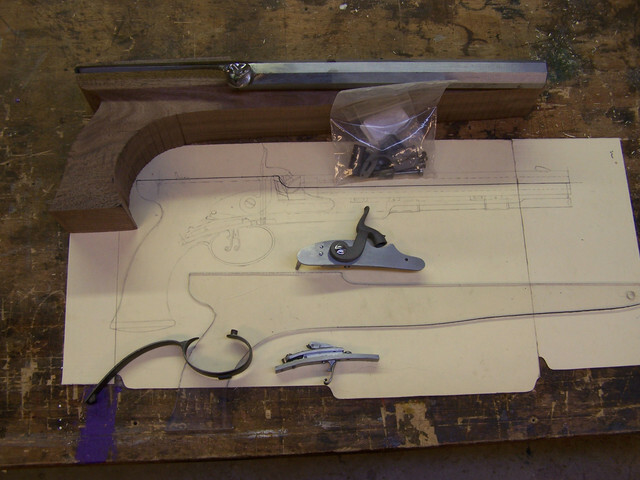 Then lay out the lock to match, then the triggers to work the lock, and then you can start to sketch in the profile. Keep the trigger as close to the grip as you can. My client has hands that can easily pick up a basketball but I still kept the trigger as close as possible to the grip. Here's a couple of images to hopefully help to explain what I'm talking about. handle types.Please keep us in the loop as this piece progresses.